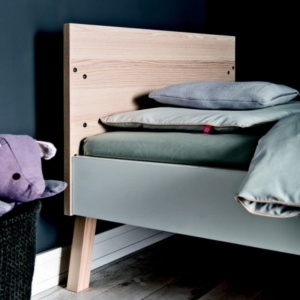 The multiple award-winning VOX modern kids furniture ranges are now available in South Africa. VOX’s playful yet practical pieces are delighting parents and youngsters who appreciate functional modern design. One of VOX’s unique features is that they source hot designers for each new modern kids furniture range. The Spot by VOX range was created by the Viktoria Lena, who received numerous design awards, including the prestigious Design Award 2015. The range’s playful yet thoroughly modern look centres on the letter “A”, with a unique A-frame design in durable light, neutral-coloured wood. The functionality of the Spot kids furniture is one of its main drawcards, with ample storage space at the bottom of the triangle which is ideal for large bags and boxes. The frame extends to the top cross-bar which allows for hanging accessories and adding personal touches. Draping a blanket over the “tipi daybed” transforms it into a fort or secluded den. The furniture is also designed with the child’s growth in mind, with the cot converting to a toddler bed, and the compactum graduating to become a dresser or desk. The sleek, simplistic design of the Young Users bunk beds appeal to the stylish teenager with its clean black and white lines. Functionality is still top of mind though, with innovative storage solutions to maximise space. The Trundle Bunk Bed is perfect for sleepovers with a third bed pulling out from underneath the lower bunk. Alternatively, the Young Users Storage Bunk Bed has a neat drawer to slide underneath the lower bunk, while the Multi Bunk Bed has a study desk and cupboard built in under the top bunk, making it an easy “room in a box” solution. To top it off all VOX’s furniture pieces are made with modern laminate wood which makes it durable, resistant to scratch and easy to clean. VOX cares about the harmonious development of children and youngsters in all its aspects and caters to the modern kids furniture market. They invest in research and development through initiatives like the Human Touch Group, in partnership with design schools and educational institutions in their native Poland. In this manner, they derive knowledge about the needs of the modern user and respond with design pieces which create innovative and surprising solutions. VOX promises the homemaker and designer the ability to create a personalised space where users feel comfortable and are able to express themselves freely. VOX is distributed exclusively in South Africa by Clever Little Monkey, the online platform known for the highest standard in quality and design for kids. VOX is among various cutting-edge international brands imported by Clever Little Monkey, such as Moba, Lorena Canals, Leander and Flexa.